SCOTTSDALE – Matt Cottle named his home bakery Stuttering King, drawing inspiration from King George VI’s fight with his stammer. Instead of delivering speeches, the challenge for Cottle is establishing himself in the job market as a person with autism. After graduating from high school, Cottle found himself interested in baking and started searching for culinary training opportunities. However, both traditional and special culinary school turned out to be frustrating. His mother, Peggy, said noise, clutter, activity and sequencing are stressful for anyone, but most people’s brains function to allow them to overcome them. “A person with autism does not,” she said. Cottle is among those with invisible disabilities, a group that accounts for 80 percent of all disabled persons. Bill Manson, Western Economic Development Corp.’s director of employer outreach, said many times people with invisible disabilities choose not to disclose their conditions for fear of being stigmatized. On the other hand, employers oftentimes don’t value people with disabilities because they are fearful, he said. “Their fear is not instilled by what they know; it’s by what they don’t know,” Manson said. 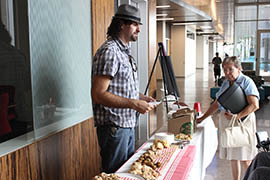 Cottle eventually hired a mentor to provide one-on-one culinary training, and today he makes pastries for coffee shops and events. His mother said she also asked managers at the supermarket where Cottle worked pushing carts to give him a position in the bakery. For two years, they rejected her request, she said. One of the events for which Cottle bakes pastries is a job fair called DREAM, which stands for Disability & Rehabilitation Employment Awareness Month, held recently at Gateway Community College. Jessica Brosilo, coordinator of career services at Gateway Community College, said employers who participated in the job fair’s first four years returned to hire more disabled workers. “It is hard enough to find employment, but if you have an obstacle or challenge it can be really difficult not just to find a job opening but to find the right fit,” she said. Manson with Western Economic Development Corp. said individuals with disabilities stay in jobs longer than other employees and demonstrate more creativity. “They also are typically willing to do jobs that others are not willing to do,” he said, noting people with disabilities sometimes start with the entry level when entering or re-entering the workplace. According to the 2012 Disability Status Report from Cornell University, the overall employment rate for people with disabilities in Arizona is 35.1 percent versus 73.1 percent for people without disabilities. Among those without jobs, only 10.2 percent in the disability community were looking for one, the report said. Peggy Cottle said she hopes a combination of training and recruiting can help more people with invisible disabilities find their right fit. Matt Cottle, a Scottsdale resident with autism, runs a pastry-making business that catered a recent job fair for the disabled.